Edward Steichen is best known for his fashion photography--in the 1930s he was chief of photography for Condé Nast publications, which included Vogue and Vanity Fair. But one of the great photographer's lesser known roles was as President of the Delphinium Society of America. His archives at the Eastman Kodak House contain an entire section known as the Delphinium Papers, devoted to his passion for plant breeding. In June 1936 his flowers were the subject of an eponymous show at the Museum of Modern Art in New York. 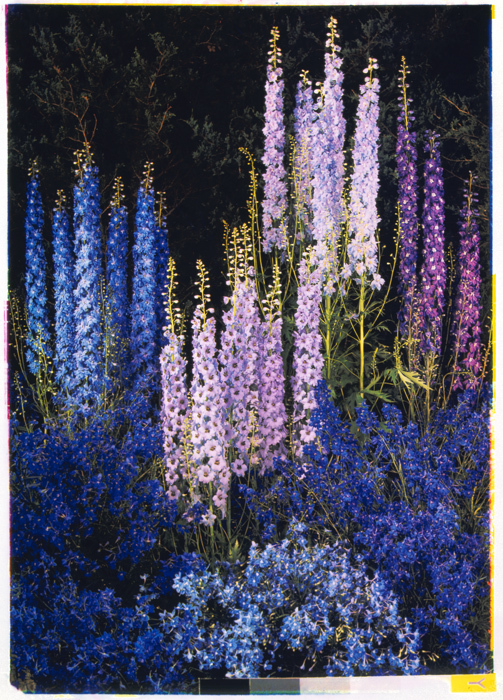 Edward Steichen’s Delphiniums showed the preternaturally tall, unusually colored delphs for a week, taking pains to remind prospective visitors that the exhibit was not photos of plants, it was the real thing! 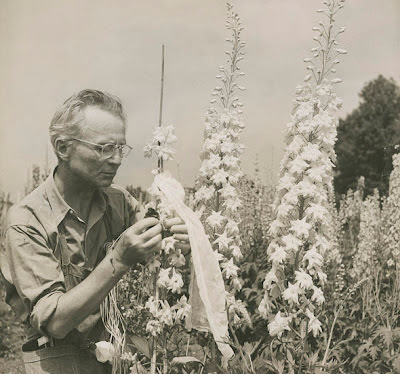 Unwilling to entrust his precious blooms to some mere art handler, Steichen trucked them to the museum galleries himself from his 400 acre farm (10 planted solely in delphiniums) near Redding, Connecticut. 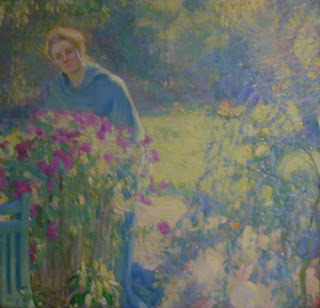 It was the first and only MoMA show dedicated to flowers. It is now also considered the first intersection between genetic modification and art: Steichen applied colcichine, a chemical mutagen that induces chromosome doubling, to his delphiniums. 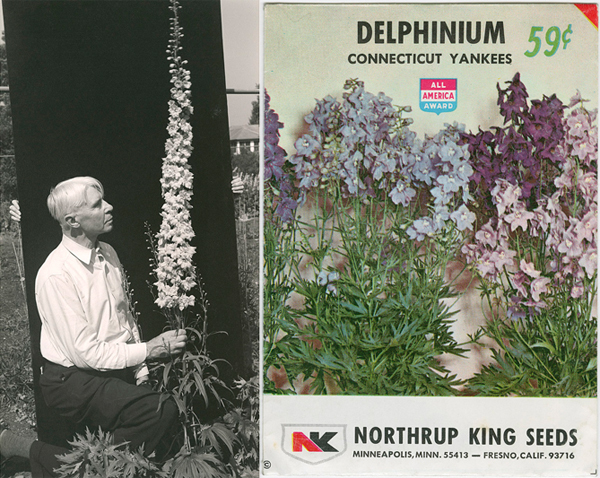 The normal delphinium of the day was three to four feet tall; Steichen's could be seven, as seen below in the white behemoth he named for his brother in-law the poet Carl Sandburg. His most popular variety, the Connecticut Yankee, was named as an homage to Mark Twain and is still commercially available. How much does gardenhistorygirl want to see an exhibition of giant delphiniums next to a display of Modern Architecture? So much. 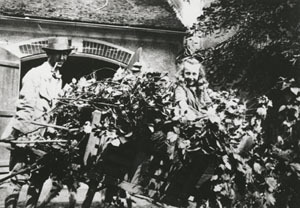 The press release records that Steichen had been working on his delphiniums "for twenty-six years", that he had been interested in the cross-breeding and selection of flowers since "thirty years ago" but that his particular interest in delphiniums dated to 1906, which even precedes his time at Voulangis par Crècy-en Brie, a village just northeast of Paris where the Steichens lived from 1908 until the outbreak of World War I in 1914. It was of that landscape, where Man Ray and Brancusi toasted the poplar column, that his daughter, Mary Steichen Calderone spoke: "The lovely garden created by my father came to mean as much to him as did the garden at Giverny to Monet—a bottomless well for creativity, peace, challenge, joy, inspiration, surcease, renewal—and sheer sensual pleasure." 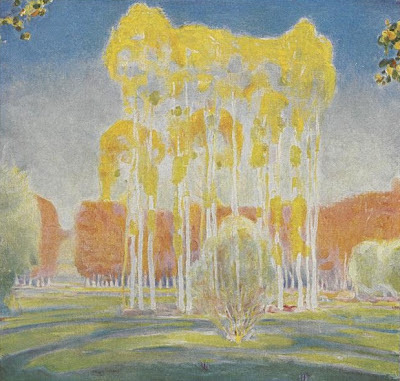 Edward Steichen, The Voulangis Garden, May 1908, oil on canvas, Steichen Family Collection, from the US National Gallery of Art. The woman pictured is Steichen's wife Clara. ......could one of these have been the trunk carved by Brancusi? I have never had success with delphiniums in my brutal Oklahoma summers. But I will try again, in a rare shady spot in my garden, with Connecticut Yankees, for Edward Steichen's sake. I first found information on Steichen's delphiniums in an article by Ceila Hartmann at the MoMA blog. There are two sources I haven't been able to access: a full account of the exhibit in Gedrim, Ronald J. "Edward Steichen's 1936 Exhibition of Delphinium Blooms," in: History of Photography (vol. 17, No. 4, Winter 1993, London: Taylor and Francis), pp.352-363, and "Delphinium, delphinium and more delphinium!" by Steichen himself published in the journal of the New York Botanical Garden, The Garden (March 1949). If you have a copy of either please share them! The Heavy Roses image is widely available around the web but the one in this post is from Christies, where the original sold for $108,000 in 2005. See also an enlightening local history article about Steichen's time in Redding Connecticut. Lumiere Press has published a very beautiful and equivalently expensive volume of newly discovered photos from Steichen's time in Voulangis. Thank you for this fantastic post! 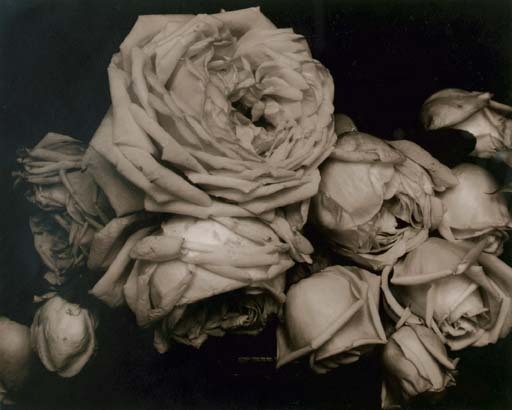 I knew nothing about Steichen before, nor that MoMa had ever done an exhibition of FLOWERS! And those "engineered" delphiniums are very impressive. I cannot even get the regular varieties to flourish at my family's garden in Michigan, presumably due to the sweltering summers. This is just fascinating. 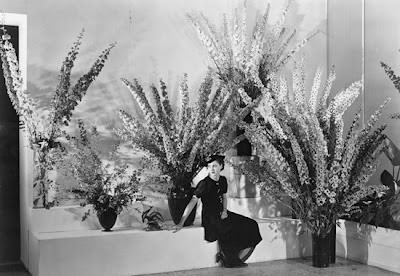 7' tall delphiniums would have been good but you threw in Steichen and Sandburg to boot. Thanks for the great post. Fascinating. And I'm with you on the need for more exhibitions of giant delphiniums and modern architecture. Inspiring. How wonderful it would be to walk in a garden with 6' delphiniums. I did not know this about Edward. Thank you for this post. I do remember reading that in his later years he commented that if anyone damaged his precious shadblow tree he would probably kill them. awesome blog. i found the watercolors you posted on versailles -- they're lovely! i'm studying landscape architecture and will hopefully start a blog that i actually keep up like yours! PS What! You also make 'Playscapes'? My classmates and I all drooled over this blog when we were designing a children's garden...it was a helpful and inspiring resource. Thank you for this! I am now a fan of your blog...you opened up another wonderful aspect of gardening for me, a newbie gardener!! So glad I found your blog....just starting a project on 'lost' gardens and reading it and going back through your archive is incredibly useful and interesting. Thank you! A long time fan of Edward Steichen, I was very pleased to find your blog this morning! I come from a long line of gardeners and am thinking of taking it up myself. I look forward to following your blog.